It’s happened to everyone who’s ever owned an older or used vehicle, and it can be a scary situation when it happens. Your car won’t start and you just know you should have replaced that car battery months ago. Now you hear it trying but failing to start and you’re stuck. You must jump the car, but you can’t quite remember how. If you’re stuck on the side of the road right this moment and you want to know how to jump a car, read on. With a calm and focused mind, you can trust in yourself to get the job done in a jiffy. Park the two vehicles facing each other with about 18 inches between them. The vehicles should not be touching each other. For vehicles with automatic transmissions, put the vehicles in park. Manual transmission vehicles should be set in neutral. Be sure to set the parking brakes in both vehicles. Turn off both vehicles and remove the keys from the ignition. Put the jumper cables on the ground and do not let the clamps touch each other. Open the hoods of both vehicles and locate the batteries and battery terminals using the vehicles’ owner’s manuals if necessary. Locate the + or – signs or red or black areas and identify positive (+) and negative (-). Attach the RED Positive (+) cable clamp to the Positive (+) terminal on the dead battery. Then attach the RED Positive (+) clamp on the other end to the functioning vehicle’s Positive (+) terminal. Connect the Black Negative (-) cable clamp to the Negative (-) terminal of the working vehicle’s battery. Attach the other Black Negative (-) clamp to an unpainted part of the vehicle that is metal. It can be a clean nut on the engine block or something similar to ground the extra energy. This will keep you safe during the jumping process. Start the working car and let it run for a minute or so. Try starting the dead vehicle. If it doesn’t start, let the working vehicle charge the dead battery for another couple of minutes before trying again. 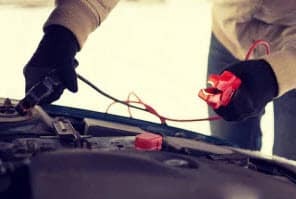 When the dead car starts running, you may disconnect the jumper cables starting with the Black (-) cable first. Be sure that none of the clamps touch each other while you are disconnecting them from the vehicles. Take the vehicle directly to your local service center and have the battery checked. It may need to be replaced. Ahh! My Car Still Won’t Start! If you tried to jump your car and it still won’t start, we’re afraid you’ll have to either take the functioning car and get a new battery or have your nonfunctioning vehicle towed to a local service center for a replacement. Most likely your car battery has died. You can get a new battery at BMW of Manhattan, your local service center near Manhattan, Bronx, and Queens. The service center at BMW of Manhattan is open Monday through Thursday from 7:30 AM until 7:00 PM, Fridays from 7:30 AM until 6:00 PM, and on Saturdays from 8:00 AM until 5:00 PM. Our phone number is 877-760-0883, or you can schedule a service appointment online.